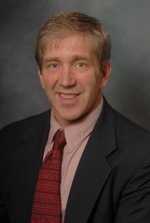 Part 1 of the “Youth Hockey Training Blueprint” series presented a real-world example of the environment and philosophy by which a youth hockey organization off-ice training program was designed. Part 2 picks up with age-specific training principles and guidelines, and provides examples of the exact dynamic warm-ups we use for these teams. Enjoy! 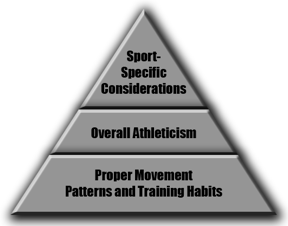 In general, age-specific recommendations follow the progressions outlined in the athletic development pyramid below. The goal is to create a solid foundation of proper movement patterns and sound training habits, upon which elite level athleticism can be built. These age groups are simply general guidelines based on average physical and psychosocial development rates. To paraphrase my mentor Mike Boyle, it’s important that we don’t apply adult values to youth sports programs. The importance of having fun should not be overlooked in the development process. These divisions are also ideal from a scheduling standpoint. In this organization, teams around the same age group have similar practice days and times, which caused time slots on specific days with multiple teams having the exact same off-ice training time slot. Because these overlapping teams fall in the same “Group”, it’s possible to combine them into one larger group for training purposes. While some of these qualities should develop organically via the training process, many of the players don’t have a sufficient understanding of the importance of soft-tissue and flexibility work, and warming up. As a result, we place a lot of attention on these things early on so that players begin to internalize these practices as beneficial and necessary, not as a hassle easily bypassed. When captains are named at each team, they are notified that after the first month they will be expected to run their team’s warm-up. This gives them the knowledge and confidence to implement the warm-up before practices and games when a member of our staff is not present. The same static stretch circuit is used but performed at the conclusion of the off-ice session instead of the beginning. In our experience, younger kids tend to lose focus quickly if immediately put into a static environment. We prefer to get the kids in organized lines and moving immediately, and approach the flexibility work later in the session. From a myofascial standpoint, an argument can be made for the benefits of static flexibility work at the beginning and end of a training session; the timing of this work is less important than just ensuring that it gets done. Stay tuned for Part 3 which will present training templates and our approach to periodization for each age group! 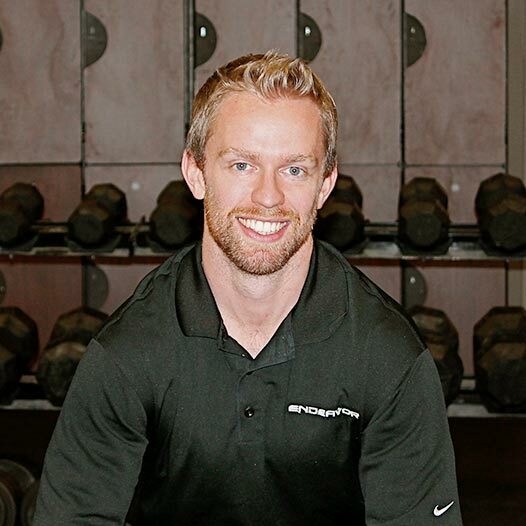 If you’re looking for other quality off-ice hockey training information (tips through articles, sample training programs used by NHL players, unique exercise videos, comprehensive webinars, and an open forum to have training experts answer your personal questions) from some of the world’s leaders in off-ice hockey development, check out HockeyStrengthandConditioning.com! You can get instant access to all of the information for 7-days for only $1! P.S. Don’t forget to check out Hockey Strength and Conditioning for more great hockey training tips! P.S.2. As always, I appreciate you forwarding this along to anyone you think will benefit from the info! You can use the social media dropdown menu at the top right hand corner to share it via Twitter and Facebook!